A series of local news stories today covered the recent spell of freezing and near-freezing temperatures in the Tampa Bay area and the affect these temperatures have had on local farmers and their crops. 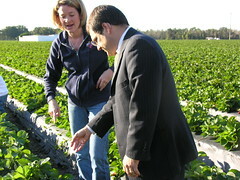 They also refer to Congressman Bilirakis's visit to Parkesdale Farms in Plant City, which suffered relatively major crop damage. Bay News 9 was on-site at the farm all day and, aside from TV coverage, filed this story online . 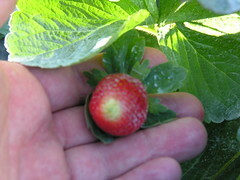 . .
Parkesdale Farms, one of the Bay area's largest strawberry farms, suffered a devastating crop loss after a watering pump went down Wednesday night leaving acres unprotected. Crews were getting ready to spray water on the berries hoping a coat of ice would protect them from a hard freeze when disaster struck. "Right when we started pumping, when the water was coming through the main water line, it burst," Kristen Hitchcock with Parkesdale Farms said. "So it caused a washout, and the washout caused our main fertilizer tank to fall onto our pump. Then the pump fell onto the fuel line, so we had to turn everything off. . . . It's killed us for a while," Hitchcock said. From the Tampa Tribune . . .
U.S. Rep. Gus Bilirakis visited the owners of Parkesdale Farms on Thursday to discuss the possibility of obtaining federal disaster assistance to cover the losses. "It's pretty devastating," Bilirakis said. "They say they won't have any pickings for six weeks. So they're estimating they're going to lose about $750,000." St. Pete Times provides more on the predicament facing the folks over at Parkesdale and other local area farmers in the wake of this recent freeze . . .
"It's doable, but who wants to think, 'Dang, I'm at a loss already,'" Gary Parke of Parkesdale Farms in Plant City, said Thursday afternoon as he noticed tinges of brown on some plants. The mercury bottomed out at 34 degrees early Thursday at Albert Whitted Airport in St. Petersburg, 29 degrees in Tampa, and tied a record low of 27 degrees in Lakeland, the National Weather Service said. Hernando and Citrus counties recorded temperatures in the 20s. Parke said he recorded 26 degrees in his east Hillsborough fields. Other nearby farmers saw similar temperatures below 30 degrees throughout the night. About 21 of Parke's 250 acres were left vulnerable for 90 minutes when an irrigation pipe burst Wednesday night. 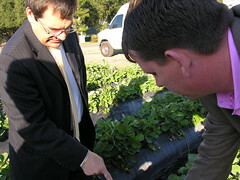 Growers spray water to insulate their plants from a hard freeze. Parke said it was too early be sure if all 21 acres of plants were lost because damage sometimes takes a few days to show. Affected farmers may be eligible for federal loans or -- if damage is widespread -- a supplemental federal appropriation, U.S. Rep. Gus Bilirakis said. "It's a shame. Twenty acres of damage, and they won't be picking for weeks," said Bilirakis, R-Palm Harbor, who toured Parkesdale Farms Thursday evening.